Gorgeous outdoor pool with cascading waterfall and Jacuzzi. 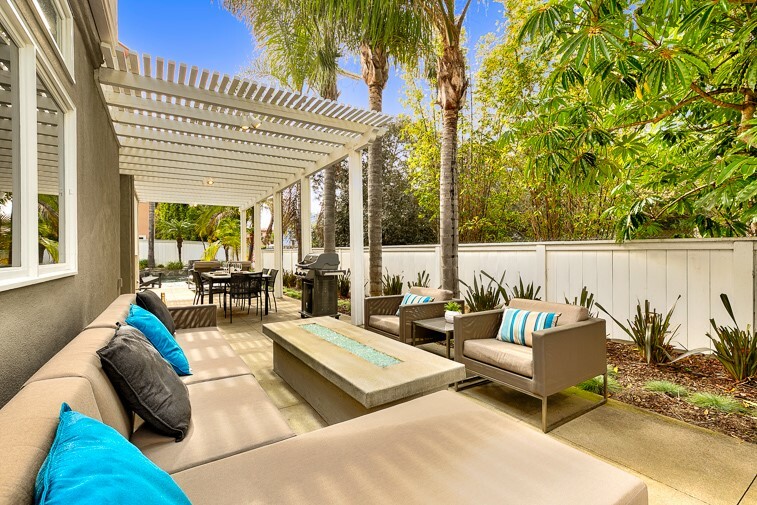 Beautiful backyard patio with plenty of space is the perfect place to dine and lounge. 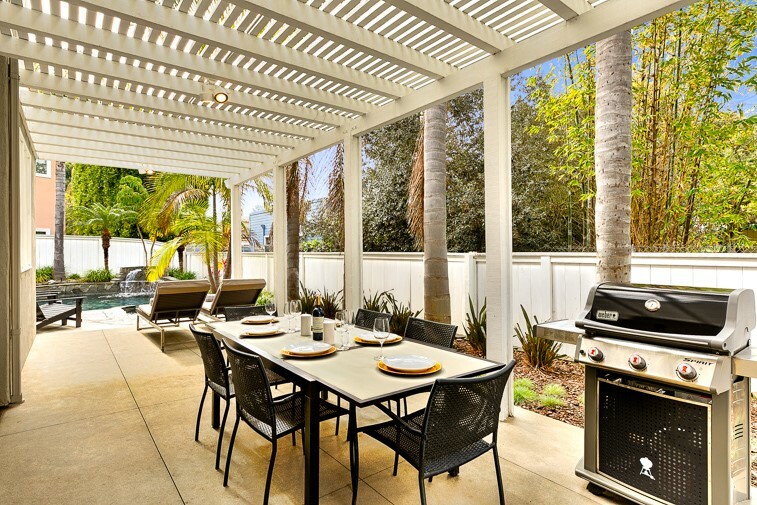 Enjoy outdoor dining & BBQ under the covered backyard patio. Relax by the firepit after a day at the beach or other adventures. 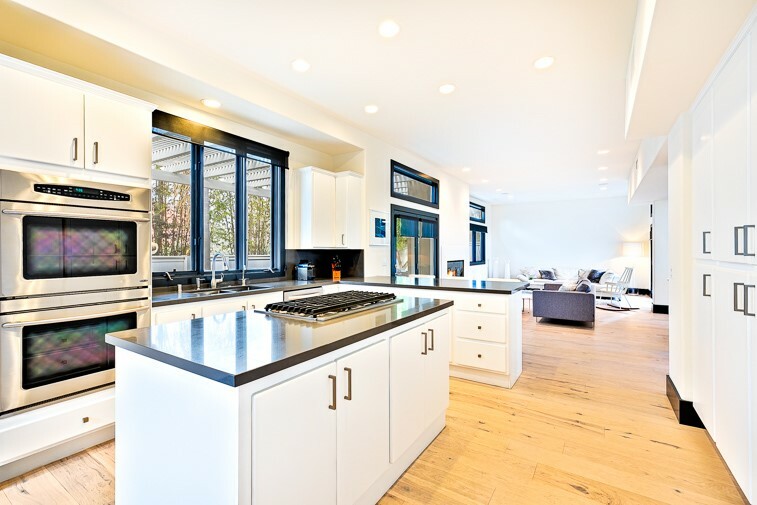 Large sliding glass doors open up into the bright, modern kitchen. 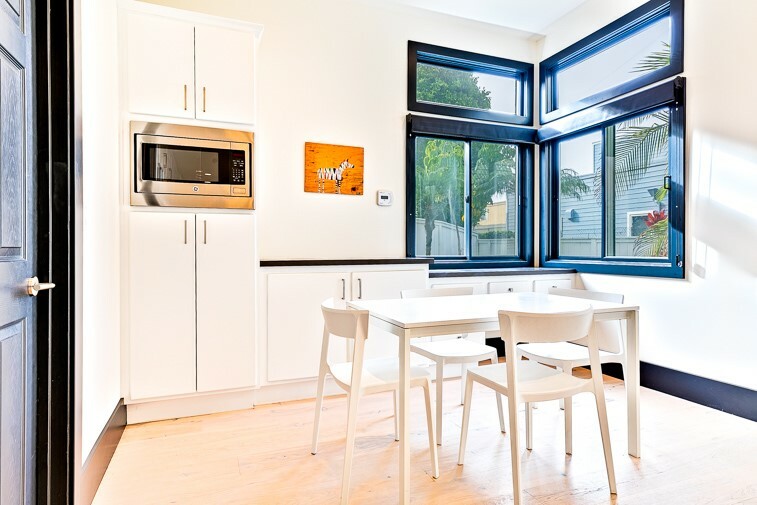 Large spacious kitchen with modern appliances and breakfast bar opens up into the family room. 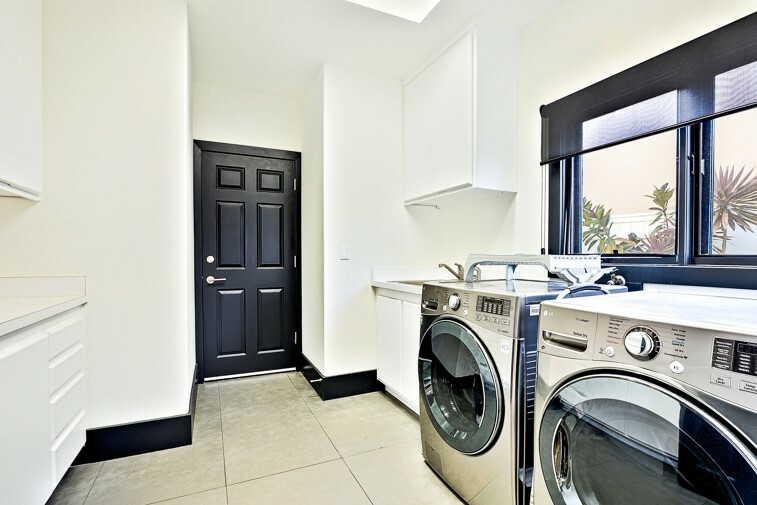 Large laundry room - conveniently located right off the kitchen. Small eating nook in the kitchen. View from the kitchen, looking into the open concept living/dining area. Snuggle up by the fire on those cool San Diego evenings! Vantage point from the kitchen towards the large sliding doors to the back patio. Living/dining area from the front entrance. From the dining room, looking towards the front entrance, guest bath, and staircase. Colorful, hip, modern living room space. Master bedroom with king bed, fireplace, and ensuite bath. 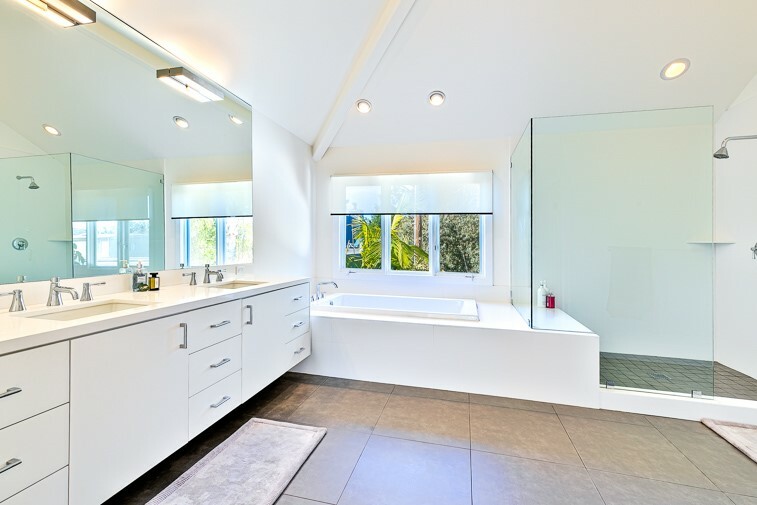 Large master en suite bath with walk in shower and tub. Full bed, guest bedroom with flat screen TV. Queen guest room with a table and chair. Guest bedroom with full bed. Upper level guest bathroom with combination shower/tub. Extra room with convenient full size futon sofa. 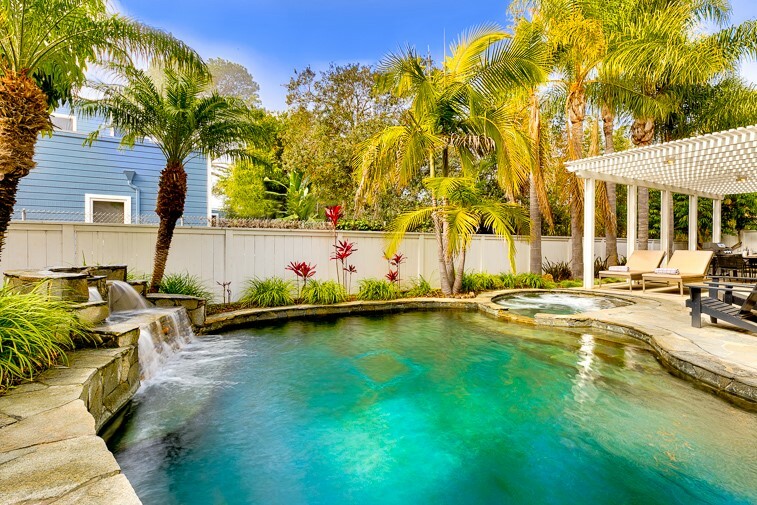 Relax in the Jacuzzi or on the comfortable lounge chairs in this serene backyard. View of this meticulous home from the street. Lower level guest 1/2 bath. An beautifully designed pool with a cascading waterfall and a Jacuzzi, a barbecue, and a table for dining al fresco - accompanied by lots of comfortable seating around a fire pit - make indoor/outdoor living a true joy - and it is easy too. Enter this 4-bedroom, 2.5 bath, 3200 sq. ft. 2-story home and find yourself in a spacious beautifully appointed great room with a dining room that seats 8, a TV den area, a living room area with colorful hip furniture where you can enjoy the fireplace and the large flat screen TV. 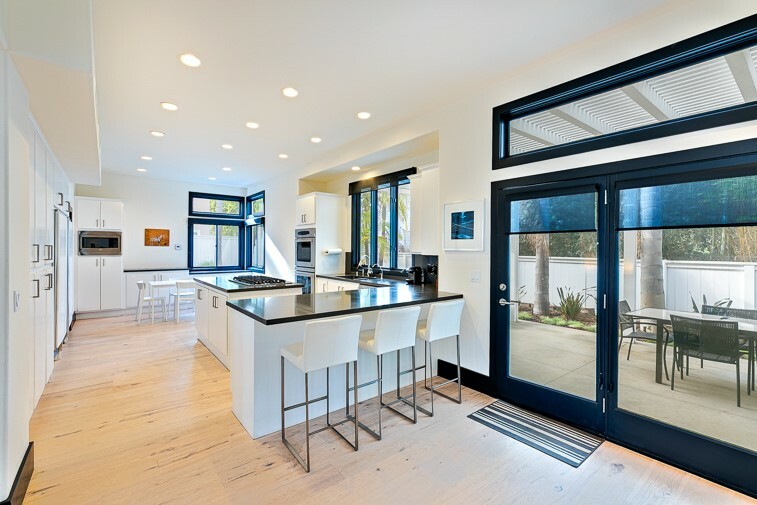 A large door opens up to the modern kitchen from the serene outside patio area with the Jacuzzi. 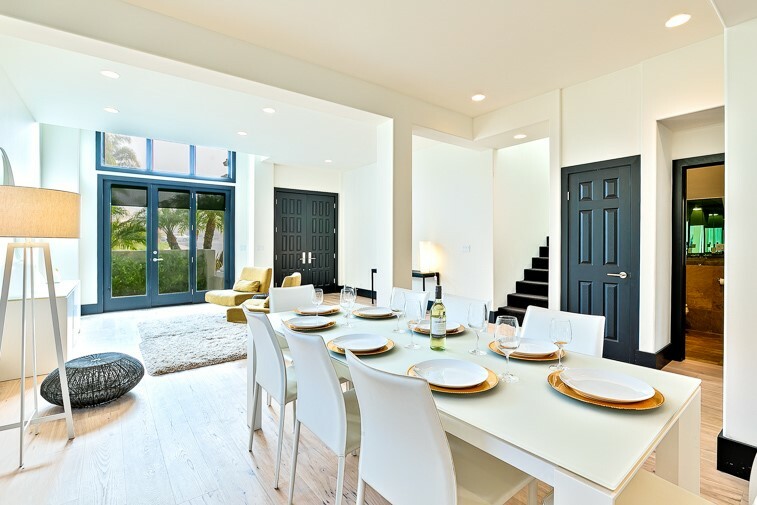 With a kitchen bar with high-top stools, and a small dining area, it is easy for everyone to eat together. Just add the food and the fun and you have everything you need to fuel yourself for your various adventures. 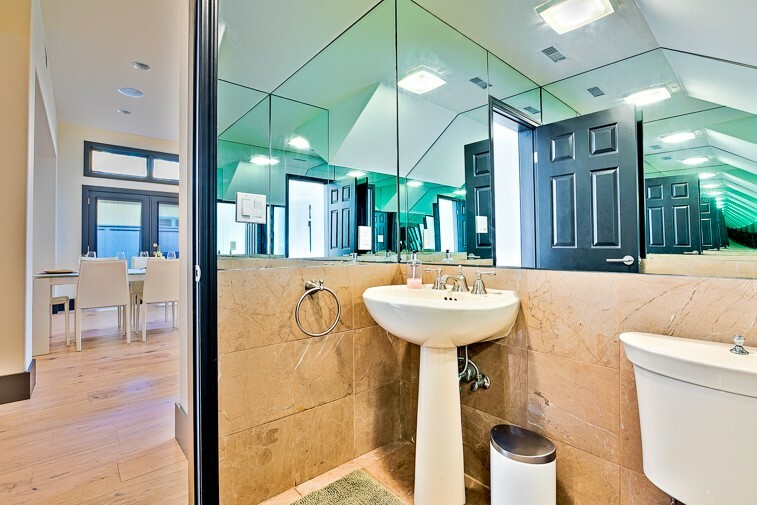 For your convenience there is a half bath and a large laundry room right off the kitchen. A spacious king master bedroom has a fireplace, a large flat screen TV, French doors to the outside and an en suite bath with a walk-in shower and a separate soaking tub. A 2nd bedroom has a double bed with a flat screen TV. 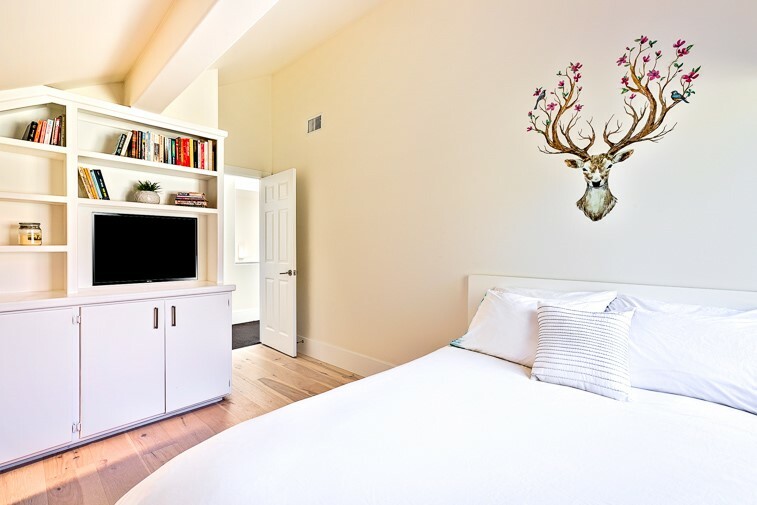 The 3rd bedroom has a queen bed with a long table and chair to use in the event that someone wants to work or create. 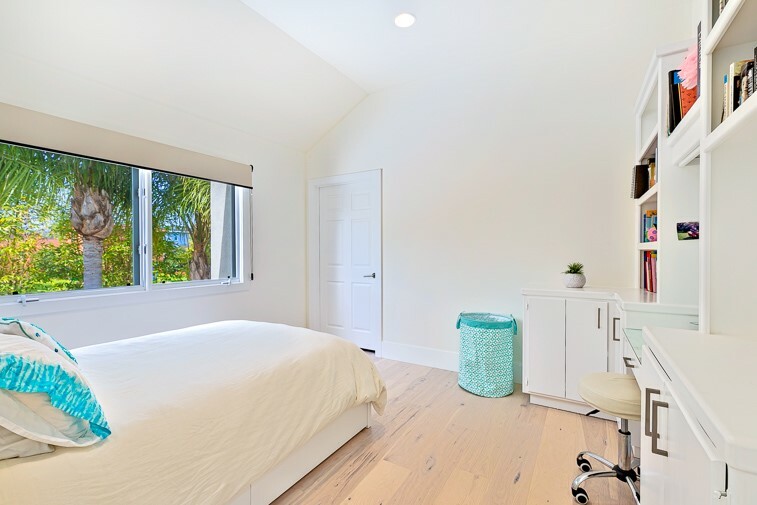 The 4th bedroom also has a full bed and there is an extra room with a full size sofa futon – so this home can comfortably sleep all 8 guests in beds. 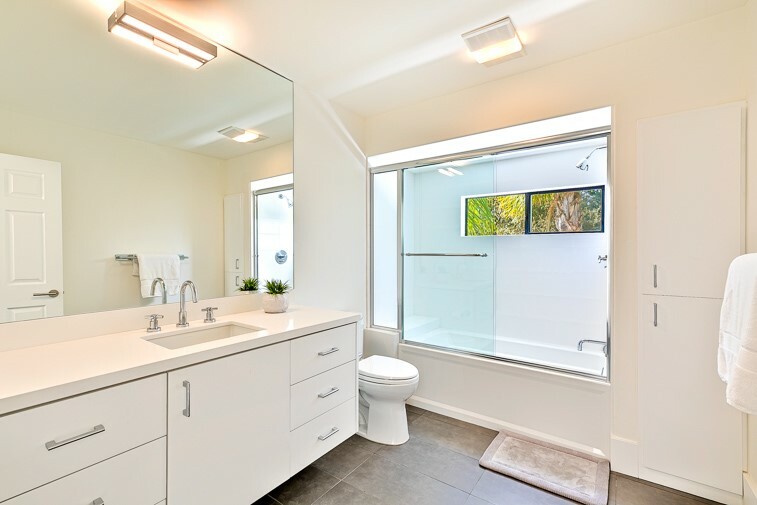 The guest bedrooms share a full bath with a shower/tub combination. All bed and bathrooms are furnished with premiere linens for your every comfort. 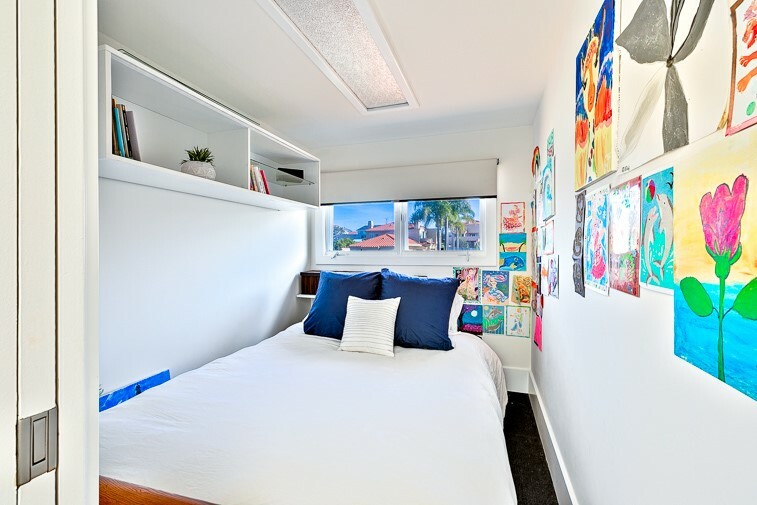 Additional amenities include off-street parking, cable, and WIFI. 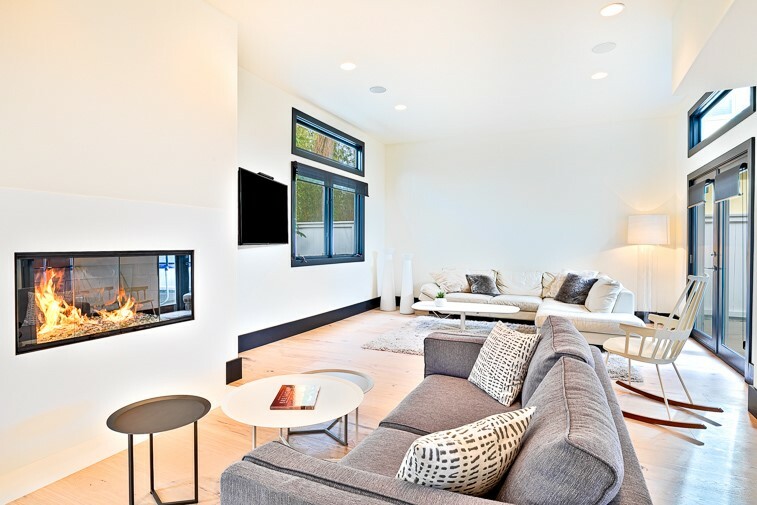 Light, bright, spacious, modern decor and furnishings with bright colorful accents that make it look and feel hip and fun. It is within walking distance (3+ blocks) to the beach and about 5 miles to the Del Mar Racetrack. 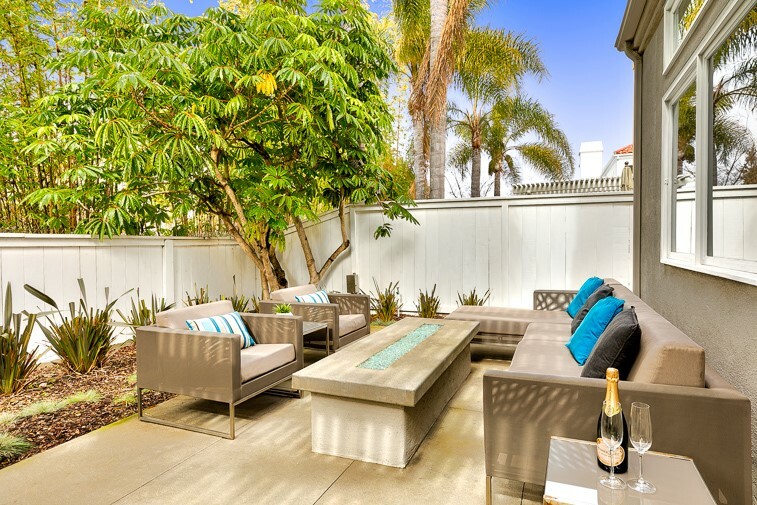 Serene, elegant backyard space complete with pool, Jacuzzi, fire pit, and lots of comfortable seating for lounging and dining al fresco so you can enjoy Southern California living at its best! No smoking inside or outside of the property - NO EXCEPTIONS! Additional pool heating fees may apply, please contact our Reservations Team for details. What an excellent property for our vacation! The property came exactly as advertised. It was nice and modern with excellent appliances and amenities. It was a quick 15 min walk to the beach and near plenty of shops and a fantastic park. Our 2 year old loved it and unlike some rentals we've stayed at there wasn't a bunch of decor items laying around for him to "play" with which is fantastic. It slept our 5 guests extremely comfortably. We used the hot tub every evening and was a great way to cap off the day. We did have to make a couple calls to the management company but they always sent someone out same day to help us even if it really wasn't required. All in all a great rental and rental company. - Reviewed By Shad M.
I spent 3 beautiful weeks in this superb contemporary villa. Great place to enjoy the beach and visit San Diego. This is a spacious home in a quiet place with a very pleasant swimming pool. We will be very happy to come back over there!! Very relaxing. Very spacious. Very stylish! Very nice large house with all you need. The location was fabulous, the rooms and pool was amazing! The property is very clean and spacious. I had a great stay. Well Worth it!! The house is fantastic with high ceilings, open plan kitchen, lounge and dining area and a massive master bedroom with ensuite. The house has been recently remodeled and renovated throughout and there has been a lot of attention to detail with light color schemes. The kitchen has all modern appliances and a vertical freezer for easy access as well as a huge fridge. The outdoor area has a pool, hot tub and outdoor sitting area which is very relaxing and enjoyable. I'd certainly stay here again. This house is one of the most comfortable houses Ive stayed in. Walking distance to the beach, stores, gym and many restaurants, in a quiet and safe neighborhood. 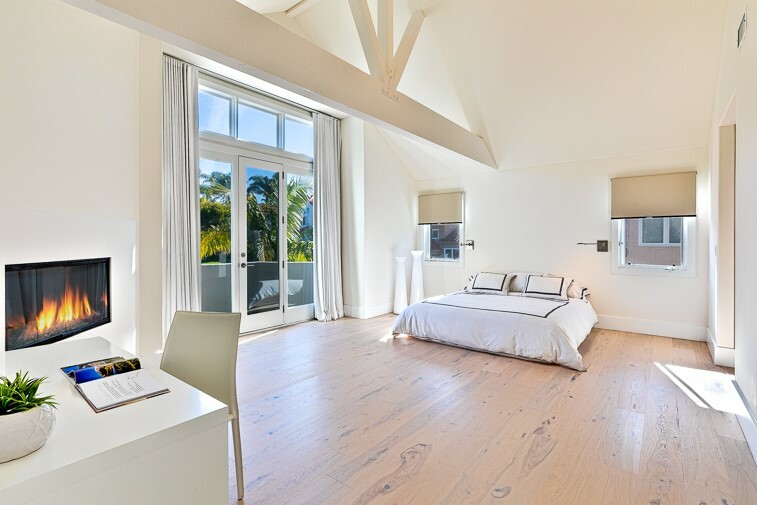 The rooms are comfy and I like the fact that the house is all white and clean and the pool is amazing! Modern, clean house with easy access to the beach. Highly recommend. Gorgeous! Southern CA dream home! This beautiful home is by far the most luxurious place I've ever stayed!! 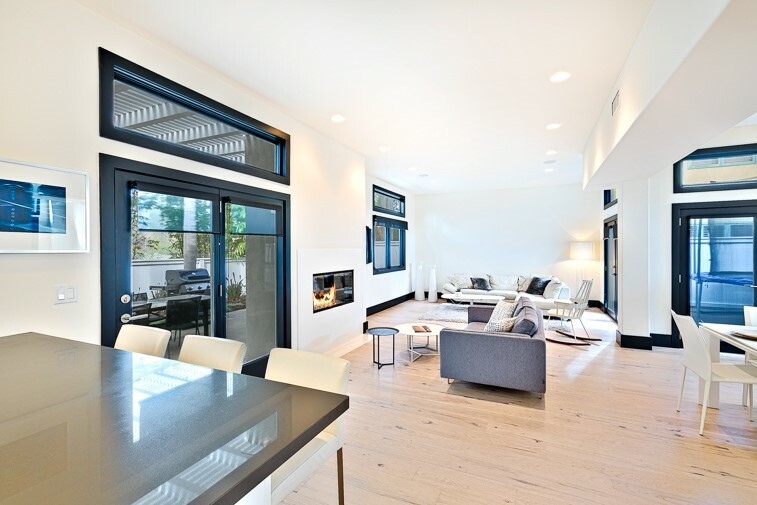 Bright open floor plan, stylish modern decor, amazing outdoor patio complete with sitting and dining areas and private in-ground pool, and the beds are incredible!!! Best week I've spent in the San Diego area! Will visit again in a heartbeat!